This medicine after all, was developed over 1,000’s of years in China and surrounding countries. The answer lies in conservation of species that are over-harvested in the wild, difficulty obtaining organic certification, and concerns over heightened restrictions on international trade. Many of the herbs in the Chinese pharmacoepia are wild harvested and, though there are regulations in China and India to protect against over-harvesting, these go largely unenforced. Over-harvesting and other cofactors have, ”resulted in 15-35 percent of all Asian medicinal plants currently considered to be in endangered status” (Shafer, p.65-66). According to Schafer, “Wild-harvesting (combined with the even larger issue of climate change), along with loss of habitat due to urban expansion (and the consequent agricultural expansion), soil erosion, disruptive mining, and other extractive technologies” are the biggest threats to wild herbs today (p.66). This herbal pharmacopoeia is truly a national heritage of China. I hope that the people working on herbal conservation in Asia continue to have support to protect and enhance this incredible resource for the whole world. However, as people who use and care about the future of Chinese medicine, we must also take part in the conservation of these plants, if we want to ensure a lasting, potent and organic supply. A Bay Area Chinese herb farmer and author, Peg Schafer has dedicated her career to the cultivation and conservation of the TCM Pharmacopeia. Her farm outside of Petaluma, CA, and her book, The Chinese Medicinal Herb Farm, are important resources in the conservation of these precious medicines. In her words, “if we are not careful to cultivate these herbs we are using in ever­ greater quantities, there is a very strong potential that we will lose more of nature’s herbal gifts to commercial or actual extinction” (p.6). Having more of a domestic product in the United States can never replace the cornucopia of medicine that is the Chinese herb market, but it can at least supplement it in a time of increasing demand and need for alternative medicines. It is important that people continue to experiment and save seeds to further research into which herbs grow well locally, and produce high quality medicine. Working with our school garden is a great window into the possibilities of growing Chinese herbs, even though it is only a small demonstration garden. We recently had a plant sale on campus, from the abundance in our garden. We sold: Purple Perilla Leaf ­(Zi Su Ye or Zi Su Zi),Chinese Motherwort ­(Yi Mu Cao), and Angelica Sinensis ­(Dang Gui). These sold quickly over the week, and are now in their new homes. One very exciting part of growing the herbs at home, is using them yourself! Zi Su Ye, known as Shiso leaf in Japan, is a great example of that. 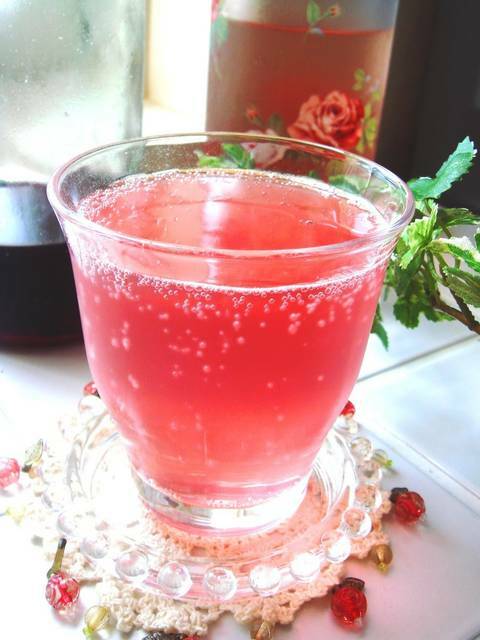 It is used widely with seafood, umeboshi plum paste, and in the special summer treat of Shiso juice. Emiko Ishihata, an AIMC student originally from Japan, shared that her family makes Shiso juice as a Summer drink. She suggested this simple three ingredient recipe of Shiso leaves, vinegar, and sugar. I imagine you could replace the sugar with honey or stevia as an alternative. Our professor Nishanga Bliss mentioned that Shiso leaves are traditionally served with sushi, and help prevent food poisoning. She explained that the little piece of plastic under most sushi, is an imitation Shiso Leaf! Shiso will make you sweat, relieves the exterior, and is good for an upset stomach and morning sickness. Use whatever type of vinegar you like such as grain, rice, or apple. Thoroughly rinse the shiso leaves, then drain the excess water. Heat vinegar on medium, add the shiso leaves, then simmer for about 5 minutes. Strain the shiso in a colander over a pot, then squeeze out the juice once it cools. It’s hot, so be careful! Leave the juice in the pot. It’s ready once the sugar has dissolved. It looks like red wine. With green shiso leaves, it’ll turn a light pink. Dilute it with still or sparkling water at a ratio of juice: water ratio of 1:5 to 1:10. This photo shows it diluted 1:10. Find this original recipe and more details here. 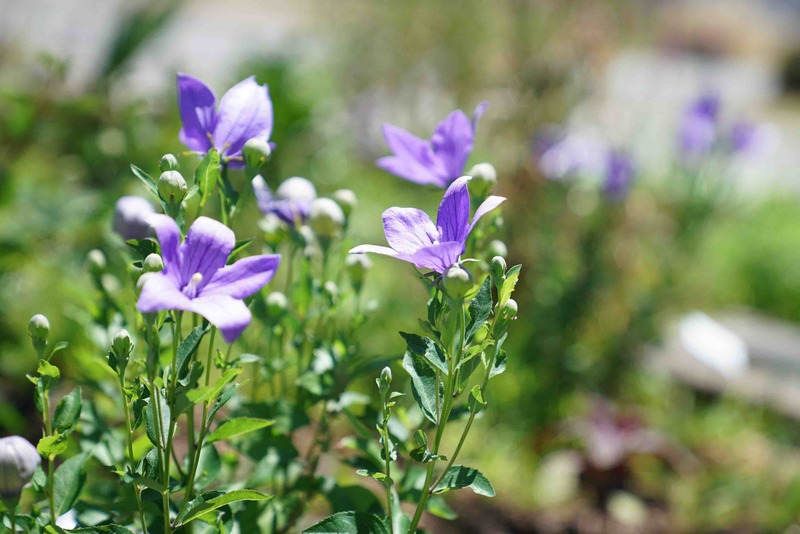 The next time you’re admiring the purple star­-faced balloon flowers (Jie Geng), watching the swaying of the purple perilla leaf (Zi Su Ye) forest, and breathing the wafting scent of Zhi Zi (Gardeniae Jasminoidis) blossoms in the air, take it all in as a whole new set of sense perceptions to support the learning of this precious medicine. May it inspire you to seek out fresh and high quality herbs and allow you to deepen into your studies of the powerful pharmacoepia of Asian medicine. Born and raised in the Bay Area, Peregrine has been exposed to alternative medicine from a young age. She learned to love plants and gardening from her grandfather and mother. 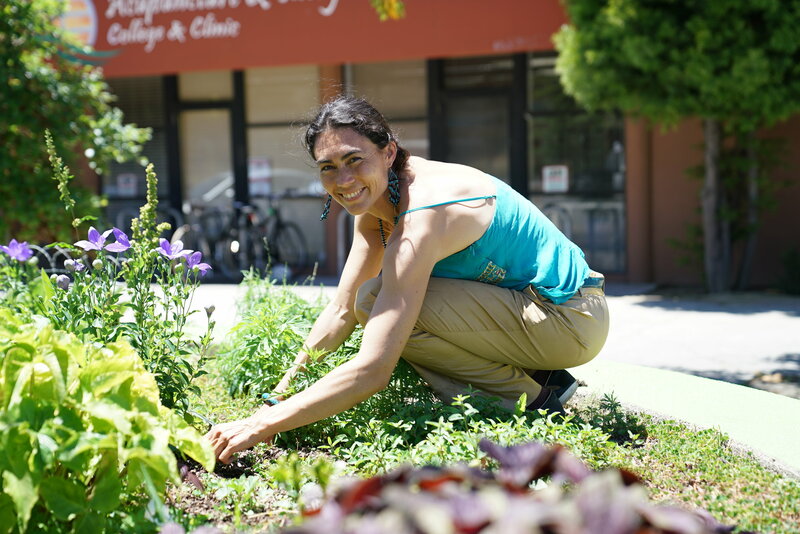 She is an enthusiastic student of Chinese acupuncture and herbs at AIMC Berkeley. She has studied and practiced permaculture for almost 10 years and is excited to apply this knowledge to the herbs of Chinese medicine. She has been an outdoor education teacher, classroom teacher, and tutor. She is also trained as a doula and hopes to continue to work with new mothers and children in her future practice. 1. Schafer, Peg. The Chinese Medicinal Herb Farm: a Cultivator’s Guide to Small­ Scale Organic Herb Production. Chelsea Green, 2012.